Ultherapy® is the ONLY FDA-cleared, effective, and non-invasive alternative to a traditional facelift and neck lift to LIFT the skin of the Brow, Face, Neck, and Décolleté. A Face and Neck Lift is the “Gold Standard” for facial rejuvenation. But for those face and neck lift candidates who cannot afford time off to recover and would be happy with moderate improvement, Ultherapy® is a great option. Ultherapy® is also great for preventing jowling and neck skin looseness in younger patients who may not yet be considered for a face or neck lift. The Ultherapy® System can tighten loose skin along your jawline, lift your brows, and minimize facial lines and wrinkles without the use of surgery, incisions, or facial fillers. Additionally, the Ultherapy® System is FDA approved for the treatment of fine lines and wrinkles in the upper chest area. At Saratoga Springs Plastic Surgery, Dr. Steven Yarinsky and our staff may choose to use the state-of-the-art Ultherapy® treatment to help you effectively achieve your facial rejuvenation goals. Ultherapy® revitalizes skin naturally, for the prevention and/or correction of the gravity effects of facial aging! What Areas of the Body Can Be Treated with Ultherapy®? Ultherapy® can be used to treat areas of the body such as the eyebrows, neck, and regions under the chin, upper chest, or décolletage. This procedure is designed to address signs of facial aging such as sagging or drooping skin. To see how Ultherapy® can work for your unique needs, schedule a consultation today. Also referred to as Ulthera®, Dr. Yarinsky and his expert staff members use the Ultherapy® System to send micro-focused ultrasound waves deep into subcutaneous skin layers in order to heat tissues, destroy old stretched-out collagen and promote newer and tighter collagen growth in targeted areas. This produces a more LIFTED and tighter appearance to your forehead, cheeks, and neckline. The growth of newly produced stronger collagen is a natural anti-aging process as it replaces older collagen and restores skin elasticity, which can give your face and chest a more youthful-looking tighter appearance. Generally, it takes about 1 hour per area of the face treated. The whole face and neck treatment takes 3-4 hours. Procedure times may vary depending on your skin type and the number of areas you wish to have treated. What Are Recovery and Results from Ultherapy® Like? There is generally no downtime after Ultherapy®, and patients can typically return to their daily routines immediately following the procedure. Some minor swelling and redness are rare but can be experienced, and there is usually little to no discomfort after treatment. You may experience mild tenderness, skin sensitivity or bruising lasting up to a week or two after the procedure. *Results gradually improve and are cumulative for three to nine months after a single Ultherapy® treatment as new collagen replaces old and your skin tightens and lifts. The final results after one Ultherapy® treatment are seen at about a year post treatment. How Long Do the Results of Ultherapy® Last? The results achieved with Ultherapy® treatment are unique to each patient and the length of time they last can vary. 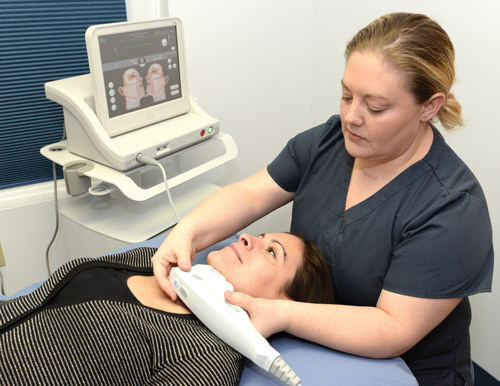 The treatment is designed to stimulate collagen growth in the targeted areas, and many patients still have fresh collagen replenishing in these areas up to a full year after the procedure. As the natural aging process continues over the years, touch-up treatments may be necessary to maintain the results for as long as possible. Patients who have moderate to severe skin looseness may benefit from more than one treatment usually given in six to twelve month intervals. For others, Ultherapy® may be repeated annually but may be done again as often as you would like to stimulate new collagen growth. How Much Does Ultherapy® Cost? The cost of your Ultherapy® treatment will vary based on individual needs and goals, the size of treatment area, and the degree of improvement desired. In some cases, it is necessary to undergo more than one treatment session to achieve the desired results. The number of recommended sessions is the major factor that determines the overall cost of the treatment. Other variables affecting cost can include the size of the treatment areas and the experience level of the provider. For the most accurate quote, please schedule a consultation by contacting our office today. Our practice also offers financing options for qualified applicants through CareCredit®, Alphaeon™ Credit, and Prosper HealthCare Lending. Our staff will be able to answer more questions about these options for you following your consultation. Are There Any Ultherapy® Side Effects? Following Ultherapy® treatment, patients may experience some degree of temporary swelling or bruising, which typically subsides quickly. Any visible bruises can often be easily concealed with makeup if you are concerned about their appearance. For the majority of patients, this treatment requires very little, if any, downtime, as it is a non-invasive procedure. Most of our patients are able to leave the office after their appointment and immediately go back to their daily activities. We recommend having someone drive you to and from your appointment if you plan to take the pretreatment pain reliever we offer. The comfort level of an Ultherapy® treatment varies with each patient. Some describe the sensation during the treatment as “uncomfortable, tolerable, spicy, or annoying.” For each patient, the sensations that accompany this process can feel different. We make every effort to minimize any discomfort throughout the procedure. We provide pretreatment oral pain relievers to make Ultherapy® more comfortable. You will not need any pain medication after your treatment is done, since the sensation is over as soon as the treatment ends. Dr. Yarinsky can only determine a patient’s candidacy for specific procedures at your facial rejuvenation consultation. At this meeting, he will discuss all aspects of Ultherapy® with you and answer any questions you may have. There can be no guarantee of a specific outcome or result; however, many people have achieved visible significant facial rejuvenation with this procedure. For more information on Ultherapy®, or other minimally-invasive skin treatments like BOTOX® Cosmetic and truSculpt™ Fat Reduction offered at our medical spa near Albany, please contact Dr. Yarinsky at our Saratoga Springs and Albany-area practice today.